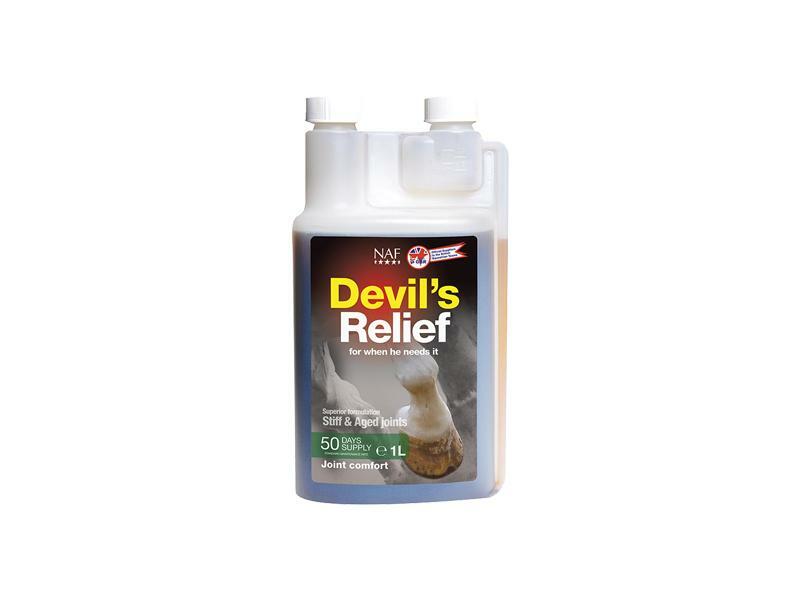 Devils Relief liquid from NAF contains a potent blend of ingredients including the native African Devil's Claw, MSM and powerful antioxidants that work together to support the maintenance of healthy joints. Devil's Claw has traditionally been used to help soothe joint pain and promote easy movement, as well as supporting the health of the digestive tract in older horses. Initially feed up to 100 ml per day for 3 days, if required. Devil’s Relief can be fed continually but is not suitable for pregnant mares. If competing, please check with the relevant competition authorities. Below are some recent questions we've received regarding NAF Devils Relief for Horses, including answers from our team. Hi, my horse is suffering from secondary ulcers from his PSD. Would like to use this to help with his joints but is it safe to use for ulcers and/or ulcer prone horses? No, I would not suggest using Devils Relief in horses prone to gastric ulcers. The active ingredient, Devils Claw, blocks prostaglandins which is helpful for pain relief in the joints but also blocks the formation of beneficial prostaglandins in the stomach. Is this safe to use along with bute prescribed from the vet? It is not recommended to use devils claw alongside bute or other NSAIDs and I would advise against it. However some horses do take both together without any problems so it is up to you. If you feel your horse needs more pain relief you could speak to your vet about increasing the dose of bute. This product certainly won't do any harm and should be helpful. It will not repair the soft tissue but could offer some mild pain relief. However if the horse is painful then prescription medication such as bute or danilon would be better. This product is not recommended for pregnant mares. It might be safe enough but the appropriate tests have not been done. We would not recommend it for any mare which is, or might be, in-foal.